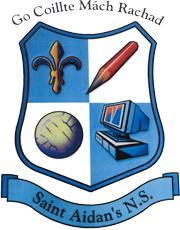 As part of Science week all classes will explore a science topic. 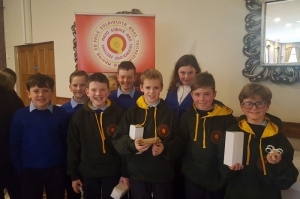 Two teams (Team 1 from 4th Class and Team 2 from 5th & 6th Classes) represented the school at Mayo Science and Technology National School Design Challenge 2017 in the McWilliam Park Hotel, Claremorris. The challenge was to construct a raft that will support a number of marbles. The Raft that stays afloat and holds the largest number of marbles wins. 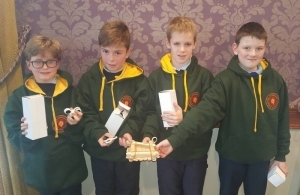 Congratulations to Team 1 Michael, Tadhg, Mikey and Cillian on securing the Runner-Up prize. Their raft held 28 marbles when tested in water! They were presented with a hoodie, a drinks bottle and a fidget spinner each. Well Done to all the pupils from St Aidan’s who took part in the challenge! All pupils from 4th -6th Class tried the challenge at school. See photos of 5th Class as they designed their rafts.